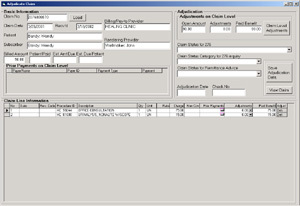 The HIPAA Claim Pro builds on top of the HIPAA Claim Printer. 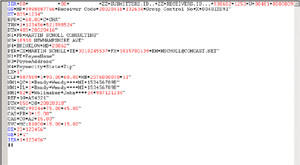 The X12 837 EDI files are parsed and then all the data in the EDI files is saved in an operational data store. From this database are adjudication, payment and claim status transaction done. The database contains also code libraries to support the standard transactions. Part of the HIPAA requirements are the ability to receive and process 837 documents and to be able to create X12 835 remittance advice files. 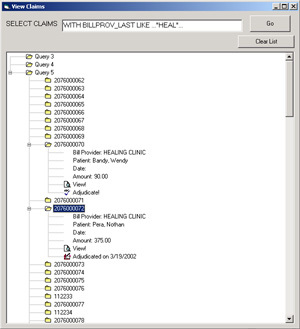 The HIPAA Claim Pro extends the ability of the Claim Printer by storing all the claim information to a database and providing screens to adjudicate the claims on a claim and on a line level. All the claim adjustments are done with HIPAA compliant code sets and the claim amount is calculated. 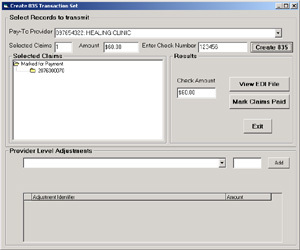 Prior payments, by subscriber or other payers are displayed. 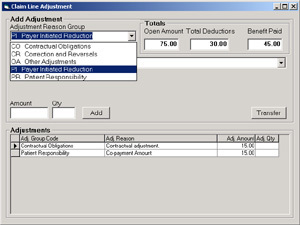 Once claims are adjudicated, a payment and a remittance advice (X12 835) can be created for a billing provider. At this point one can also make provider level adjustments like early payment discounts etc. Integrated into the product is also an EDI viewer. This is a special text viewer that allows you view the content of the EDI file color coded and with each segment on a new line. Often it is important to be able to see the segments in order to debug or fine tune the application and compare the output with the incoming raw data.